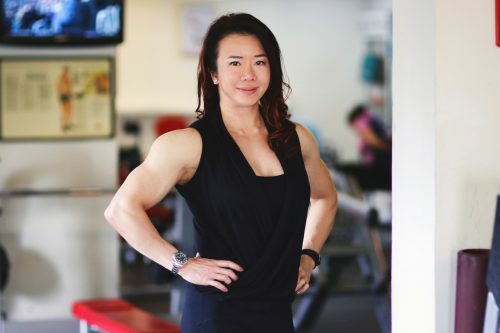 Body building veteran Joan Liew, is the first Singaporean to be awarded the International Federation of Bodybuilding and Fitness (IFBB) Pro Card. After a long career of winning Asian titles and international titles including the 2014 Arnold Classic Sports Festival and the recent 2016 Arnold classic, the Pro card will allow her to compete at a prefessional-level competition. We spoke to Joan to understand more about her journey to being Singapore’s first IFBB pro. WHAT ARE YOUR THOUGHTS ON THE STATE OF PROFESSIONAL WOMEN’S BODYBUILDING IN SINGAPORE TODAY? There has not been an increase in the number of ladies coming forward to participate actively in the sport of bodybuilding over the last decade, and as such there hasn’t been much progress at competition level locally as well as internationally. Even though there have been a handful of ladies who pursued competitions regionally and internationally in women bodybuilding and physique, it will be great to see more females to add on to the number. However on the brighter note, bikini competitions are gaining popularity and that has encouraged more females taking up weight training and getting on the competition stage. This is a good start and I hope these ladies will continue to train and progress in the sport. AT WHAT AGE DID YOU BEGIN BODYBUILDING AND WHAT MOTIVATED YOU TO KEEP WITH IT? I started training at the age of 17, right after i got my access to a gym ( in junior college).since then i always had the objective to be the best in women bodybuilding in Singapore and that was the goal that kept me going till today. I kept going simply because i was focused on my objective. I also understood that bodybuilding takes time, and I must be prepared to work very hard. I have always been competing under IFBB in my life as I see the opportunities that IFBB offers me as an athlete and how I can chart my progress with them. When I win a show, I will think what I can do next to improve myself. After my 4th straight Asian win in 2009, I knew I have to keep improving myself and I cannot progress unless I compete with more and better athletes. As such, I made up my mind to compete in the USA from 2010. Competing with the IFBB in the USA was exhilarating as I get to meet the world’s best athletes and I have a much larger pool of competitors to compete with on stage. It motivated me to train hard. I began to see that possibility of me achieving the ‘IFBB Pro’ status then, and I decided to work towards it. The vision, to be singapore’s first IFBB Pro, kept me going till today. At the same time, I surround myself with great, positive and inspiring people who helped me in their own ways to make things possible. Time does not wait- I do not waste time engaging in small talks or things that distract me from my focus. IN YOUR OPINION, WHAT COULD BE DONE TO BOOST THE POPULARITY AND MARKETABILITY OF PROFESSIONAL WOMEN’S BODYBUILDING? Firstly, I feel that the government should offer recognition to all achievements made by athletes, regardless of the nature of the sport. recognition should be given when it is due, and not just for selected sports. The media also play an important role to raise the awareness of women bodybuilding/physique sports. We need to present the true essence of the sport itself: discipline, sacrifice and determination. The athletes, men and women, should also be aware that personal image, such as how they carry themselves in the public and what they post on social media, will determine the value and goodwill of the brand for themselves and the sport. The goodwill and credibility of the brand goes beyond than simply the number of followers on instagram. When I am not preparing for a competition, I simply keep to a general healthy diet. I have 5-6 meals a day, comprising of complex carbohydrates, good quality lean protein and ample greens to go with it. Diet is something that has to be adjusted constantly to accommodate changes in lifestyle, exercise patterns and also age. My protein sources are chicken, fish, beef, eggs and protein shakes. the carbohydrates I normally go for would be rice, pasta, and sweet potatoes. I ensure I take ample green vegetables and fresh fruits daily. I eat according to my energy needs for the day and I do not obsess with the number of calories because I am in tune with my own body and how I feel in response to a particular diet, so I can adjust when I need to. Diet is something that differs with different bodies, and it also differs with every show. If it works on someone, it does not necessarily works on you. Understanding how the nutrients work, and how you complement nutritional supplementation to achieve what you want, is essential to any athlete. It is important to feed the body well, both for the purpose of health and performance. I will not encourage simply following diet plans taken from internet without first verifying or understanding the basics. there are plenty of diet fads and claims out there which may not necessarily be backed by science. I am in the gym most times of the week, for my work as well as my own training. When I am not in the gym, I would be running errands and my also girly pursuits such as doing my hair, nails and shopping. I do a fair bit of retail therapy and I am just like many girls who love bags and shoes, and in tune with whats the latest news in the international fashion industry. I do a fair bit of reading whenever I can everyday on a diverse range of topics, ranging from current affairs to politics to entertainment and fashion. I am also in the process of writing a book too. YOU ARE SEEN AS AN INSPIRATION TOO MANY BODY BUILDERS OUT THERE, WHO INSPIRES YOU? I have been working with Augustine Lee since I started training and competing in Asia. I met IFBB Pro Hidetada in 2009 and we became good friends. I have started working together with Hidetada since, when I began competing in the US at the NPC. He is a great athlete and a wonderful friend. I highly respect and share the values and principles he holds. I also met Iris Kyle, 10-time Ms Olympia winner, who currently runs a business with Hidetada in the US. Hide and Iris has offered me tremendous support and help in my journey competing in the US, from NPC in 2010 to the Arnolds from 2012-2016 and eventually attaining my Pro card in 2017. These 3 athletes have amazing traits whom I look up to: their discipline, integrity, humility, drive and determination, and that is what made them Champions. Everyone needs a mentor and coach, and its important to connect with the one who has the experience and character that can will lead and guide you to victory. Currently I am on a few projects in the business so that is keeping me very busy. Meantime I am looking at my options with regards to my first IFBB Pro show. It is a new beginning for me, and I would need to consider the options, and train very hard to prepare. I look forward to the new challenges ahead. DO YOU HAVE ANY ADVISE FOR ASPIRING BODY BUILDERS OUT THERE? Bodybuilding is a visual sport, and a relatively good physique will inevitably stand out from the crowd. A good physique can only be achieved with training and diet, and as an athlete you should be proud of your own achievements. I would like to reiterate the importance of humility in the sport of bodybuilding, because without it it would be difficult to make progress. We must continue to look at where are our weaknesses so we can work on them and turn them into strengths. Being a successful bodybuilder is not about just looking good, but one has to carry him/hers self to be a role model for the public because people will notice. This, in turn, will help to boost the image and earn respect for the sport, if its managed well. Respect has to be earned. Secondly, we also need to understand and accept the fact that in Singapore, we need to work hard in our jobs and career if we want to pursue the sport because we will need to fund our own training significantly. All my life, I have balanced my training with work and studies. I have pursued my Degree part time whilst holding a Managerial position and still continued with my daily training. Now, I run the business at the same time while I compete. I focus on the process, and I do what takes. It is about dedicating your life to do what you need to do to achieve what you want. Success doesn’t happen overnight. Learning takes time as well. We are never “too good” at something. There will always be others who are better than us, and there will be people who will be better than us if we don’t continue to learn and work hard to improve. When you achieve one goal, you must always look at how you can do better and at the same time, stay grounded and not allow success and ego to go into your head. Find a mentor who is a good role model and speak to him/her who can offer you honest advice. Most importantly, I would like to tell aspiring bodybuilders that dreams do come true if you work hard. Stay focused and don’t give up. We thank Joan for her time, and should you need help with your fitness? Head down to her gym located near Boat Quay.